The Gemsbok or oryx, Oryx Gazella, is an iconic symbol of Namibia, appearing on the country’s coat of arms and is the national animal of Namibia. A typical desert-adapted animal, the gemsbok is extremely tolerant of Namibia’s arid conditions and is found all over the countryside, including the Namib Desert. They favour grassy habitats but will adapt to what is available, picking on bushes and shrubs or unearthing nutritious tubers if they must. Most of their moisture requirements are extracted from their food and they are able to go without drinking water for months if necessary. Extreme desert temperatures are no problem to these hardy antelope, which use nasal panting to keep their brains cool while the rest of their body temperature soars. The gemsbok draws air in rapidly via its nose, cooling the air molecules down in the process. Capillaries in the nose of the antelope then send this air-cooled blood to the brain. They waste no precious moisture by sweating. The black and white markings on their bellies and legs is thought to reflect heat, thereby keeping their bodies as cool as possible. 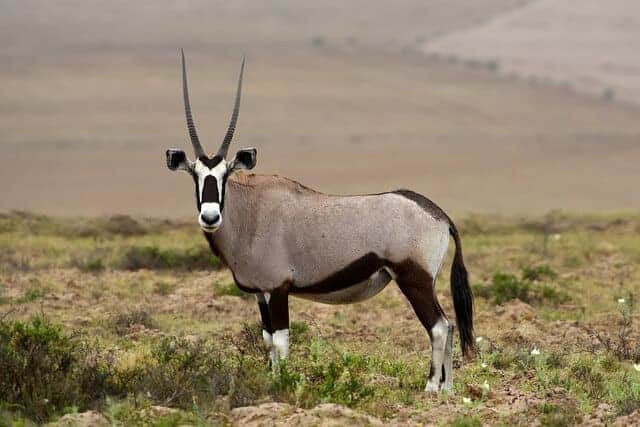 Their white and black faces though are more to show off their magnificent sword-like horns during competition for mates – size counts when it comes to female gemsbok, even though they have horns of their own, which are usually longer and thinner than those of the males. While the sandy shades of the rest of their body do blend in with the hues of their environment, they have little reason to slink into the background as few predators, even man, can survive the harsh conditions they thrive in. They are large antelope standing about 1.2 m at the shoulder, and not afraid to use their horns when threatened either, easily delivering a fatal blow to any attacker. Skirmishes between conflicting bulls often end in serious injury. Gemsbok are minimally gregarious, usually occurring in small herds as this limits competition for food. Herds have a loose structure with some consisting of a dominant bull and his harem, while others are made up of females and non-territorial males. During times of plenty, they can congregate in herds numbering up to 300 individuals. They are non-seasonal breeders and usually only one calf is born after a nine-month gestation period. To view these fascinating animals, book yourself some top accommodation in Windhoek and go in search of them in one or more of Namibia’s National Parks.